Pure, authentic, richly sweet maple syrup: New Englanders are so lucky to have a new crop to savor each spring. If all you've ever tasted is Aunt Jemima Original Syrup (Ingredients: corn syrup, high fructose corn syrup, water, cellulose gum, caramel color, salt, sodium benzoate and sorbic acid preservatives, artificial and natural flavors, sodium hexametaphosphate), man are you in for a treat when you sample real maple syrup, made from the sap that courses through the veins of New England's maple trees as winter yields to spring. And if you attend one of these maple-themed New England events, you'll experience maple's myriad possibilities and appreciate the ancient process still used to transform tree juice into one of the most delicious natural substances on Earth. Visit Old Sturbridge Village, a living history complex in Sturbridge, Massachusetts, during one of the first four weekends in March, and you'll have the opportunity to see sap boiled for syrup the 19th-century way... in steaming, fire-heated pots. You'll hear how New England colonists learned how to collect and boil sap from native peoples. 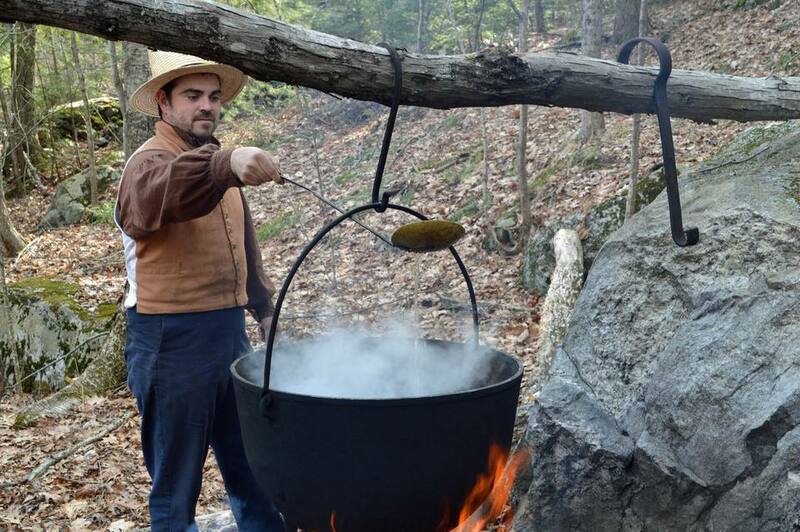 Costumed historians will cook with maple products by the hearth, and a variety of other demonstrations and exhibitions will give you a new appreciation for America's favorite pancake topping. Even the potter and the cooper will be making maple-related items. Maple lovers descend on the central Connecticut town of Hebron the third weekend of March each year (March 16-17 in 2019) to tour three area sugar houses, taste maple walnut ice cream sundaes and other sweet treats, cheer for the tractor parade and participate in family-friendly activities that are both educational and entertaining. Festival admission is free, but it'll be hard not to splurge on a few maple goodies. With more than 50 participating sugarhouses, New Hampshire Maple Weekend, held the fourth weekend in March (March 23-24 in 2019), is one of New England's largest celebrations of the sugaring season. Map a route through the Granite State that enables you to visit a variety of maple producers, large and small, and to purchase sweet souvenirs that make ideal gifts all year long. Can't make it that weekend? Maple Month events are taking place during four full weekends: March 9 through 31. On the fourth Sunday in March (March 24 in 2019), more than 90 sugarhouses throughout Maine open their doors to visitors for an up-close look at the maple syrup-making process. Most offer free tasting of their maple products, and many have a full day of festive activities on tap. Which will you choose to tour? It's tough to decide when their offers range from free ice cream with warm maple syrup to pancake breakfast to tours of the sugarbush on a tractor-drawn sled. This 25-mile, at-your-own-pace bike ride along muddy byways has become an annual tradition in Vermont. Former professional cyclist Peter Vollers, organizer and owner of Vermont Overland, calls this maple-themed adventure "epic." Sign up to participate in the March 24, 2019 trek, and you'll pedal to a sugarhouse with about 300 fellow cyclists. The maple treats that await will inspire you to keep going. Then, toast your accomplishment at an after-party at the new Ascutney Outdoors Center. Beer and food will be available for purchase. Make plans to attend this annual April celebration of syrup in St. Albans, Vermont (April 26-28 in 2019). Most activities are free at the three-day Vermont Maple Festival, which has been a tradition for 53 years. Highlights include a parade, syrup tasting, sugarhouse tours, maple demonstrations, carnival rides, street vendors, a pancake breakfast and a maple barbecue buffet dinner. On Saturday, April 27, visitors 21 and over can sample Vermont-made maple beer, wine and spirits during a Maple Beverage Tasting event. Tasting tickets are $10 in advance or $15 on-site. Maple season's last "Hurrah!" is always held the final Saturday of April (April 27 in 2019) in northeastern Vermont. St. Johnsbury dubs itself the Maple Center of the World, and this community celebration features a craft show, live music, family entertainment, a pancake breakfast and a Sap Lap 5K run (to work off those sweet calories). It all leads up to the crowning of the World Maple Syrup Champion. Festival admission is free.